October is a busy planting month, with cooler temperatures making it easier for plants and trees to take hold and thrive. 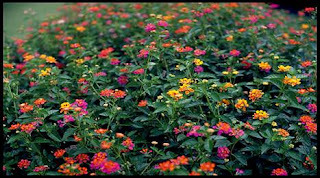 Plant Drought Tolerant Ground Cover: Ornamental grasses and a variety of flowering shrubs and plants can be planted in October that will do well in wet as well as dry months. 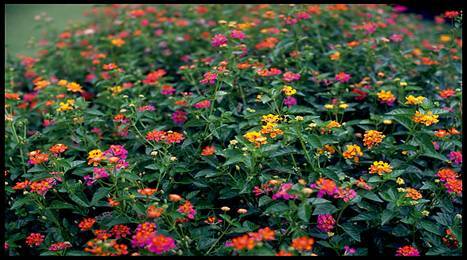 They include trailing lantana and angelita daisy (both bloom all year long), festuca boulder blue ornamental grass, rockrose and creeping Mahonia. Seek out native plants such as California wild lilac and manzanita. All love hot, dry climates and require little irrigation. It's Herb Season: Hardy herbs that can be planted in fall include garlic, parsley, chives, cilantro, dill, fennel and thyme. Basil goes to flower in fall so harvest and dry the leaves and use them for winter cooking. Consider adding these especially drought tolerant herbs: Coyote mint, English thyme, Greek oregano, rosemary and sage. If You're Keeping Your Lawn: If you are still watering your lawn, now is the time to aerate and add a layer of top dressing to the lawn. A top dressing containing biochar will help reduce the amount of water you are currently using on your lawn while working its way down into the lawn's root system and provide nutrients. Plant Cool Weather Vegetables: Many vegetable varieties flourish in cooler weather. They include beans, beets, broccoli, carrots, lettuce, peas, radishes and spinach. A steady stream of ready-to-pick vegetables will be ready in late November. Cut Back on Watering: Unless we experience unusually strong and prolonged hot Santa Ana winds, gardeners can reduce the amount of water for their lawn, garden, trees and shrubs. The sun moves lower in the sky so it is not as harsh on vegetation. Make sure water timers are shut off at least 48 hours after it rains (it's the law in most cities). Harvest Pumpkins and Gourds: Pick pumpkins and gourds when the vines are dry and the rinds are solid. Carefully cut the steams about two inches from the pumpkin. A longer stem keeps the pumpkin fresher longer. If carving, keep pumpkin seeds for eating. Separate the seeds from the pulp, wash, spread onto a cookie sheet and sprinkle with salt or other seasoning. Cook at 375 degrees, turning occasionally, until the seeds are brown on both sides. Do a Garden Clean-Up: Fallen fruit and vegetables attract pests and diseases. Before adding new vegetables, flowers or trees to your garden, spend time removing plant debris and weeds.